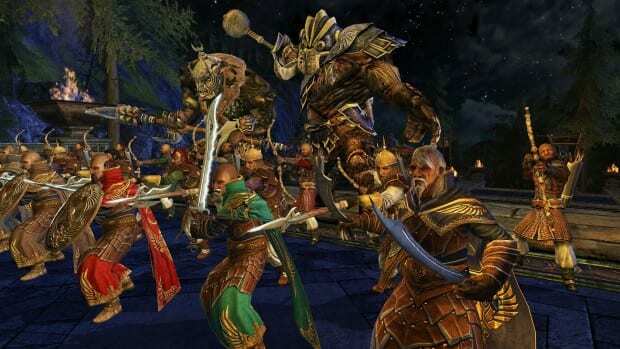 New details on the upcoming Update 10 for Lord of the Rings Online have just been released by developer Turbine. Update 10 is entitled Against the Shadow Part 2 and it adds four new raids to the game. Even as open war threatens Gondor and Rohan far to the south, allies of Mordor make their advance upon the Lonely Mountain. Travel north to the kingdom of Dale where the cruel Easterlings have already begun their assault. Help Brand ring the city bells and hold the line against enemy forces while the townsfolk begin their retreat to the safety of Erebor. With the conflict in Dale now behind, you must protect the people of Dale on their flight to the Lonely Mountain. Seeking to prevent a length siege, the enemy will surely move to crush the exposed defenders before they reach the dwarven stronghold. Gather all your strength for the road to the mountain is long and the enemies are many! Safely inside the massive gates of Erebor, the men and dwarves of the north are prepared to withstand a long siege. However, scouts have reported the Easterlings constructing a large pyre near one of the mountain vents that billows with dark, noxious gas. Slay the Easterlings and destroy the pyre before the toxic smoke fills the mountain. After weeks of holding back the enemy siege, word reaches the defenders of the Lonely Mountain that the One Ring has been destroyed and the tide is turning in the south. Intent on bringing the siege to an end, the enemy’s most powerful soldiers have issued a challenge to the finest defenders beneath the mountain. Become the champions of Erebor and slay the towering Olog-hai, driving the Easterlings from the north forever! The dungeons in this Update will be free of charge for those gamers who have already purchased the Riders of Rohan expansion. Take a look at the screens below for a quick look these Hobbit themed areas.